Any company that owns its own factory is way ahead in the bespoke game. The simple fact of having your own machines and artisans on tap means you are so much more able to fulfil a customer’s desires. Globe-Trotter, the British luxury travel goods company that is celebrating its 120th anniversary this year, still makes its own bags, luxury suitcases and small leather goods. The factory is in Hertfordshire and some of the machines there date back decades – in fact, one of the long-blade cutters used to slice the vulcanised fibreboard Globe-Trotter still uses for its lightweight hard cases is Victorian. There is also a sewing machine from the 1930s, which apparently is the only thing tough enough to penetrate the four layers of leather required for a case handle. Every Globe-Trotter case is still made by hand here, so in a sense all are individual. But most are produced according to designs that are available to all. The real gem is the bespoke department. To show what it can do, the company regularly partners with other brands to produce special limited edition runs of cases. 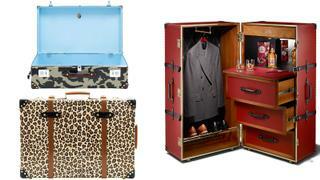 These are variations on what Globe-Trotter normally makes, but tweaked and customised to deliver something special. While these special editions are rare, for the icing on the cake customers can go fully bespoke. The easiest way to do this is to go into the Mayfair store in London, or the Ginza one in Tokyo, and ask to see what they can do for you in terms of colours, details and linings. The lightweight vulcanised fibreboard can be coloured in many hues, even panel by panel, and you can choose from the many lining swatches, which include Liberty prints. The number of variations available means that you will almost certainly come out with a unique piece – what colours do you want your corner reinforcements to be, or your leather straps, or your handle, for example? For those with their own ideas, you can always go off-piste. Recently a customer wanted a vintage map used as a lining. A little research and it was done. And then there are those who decide to add additional compartments for clothing or cameras, or have ideas about entirely one-off creations. Over the years, Globe-Trotter has made a whole variety of weird and wonderful containers – not always cases – to house watch collections, shoes, ties or even a guitar (for one Mr Clapton, no less). Others have requested large old-school steamer trunks with drawers and hanging rails, which hark back to the type of thing people took on voyages 100 years ago. One of these, for Chivas Regal whisky, even included a minibar. Then there was a picnic hamper for a European ambassador, and a six bottle wine case for the Duke of Argyll, complete with his family tartan as lining. This is proper design and build, and the process involves sketches and development from the design team. But the result is a real one-off – and the perfect case to take on board your equally individual superyacht.